The guide for your Small-Group tour will conveniently pick you up from your accommodation to fetch your bike(s) together. Once at the rental center, all desired adjustments to the bike are possible. You can even bring your own SPD (or similar) shoes. No extra charges are involved. 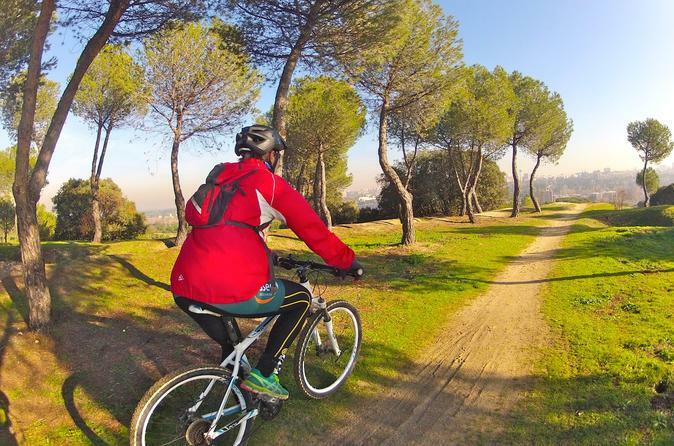 The first mile or so takes you along the beautiful Riviera of the Manzanares River. Once you enter the Casa de Campo, you'll find yourself in what once was the private hunting ground of the King. Your knowledgeable guide for this Small-Group tour will be able to take you on a large variety of single tracks without repeating any of them. Challenging climbs, defying down-hills, a loop around the city zoo... You name it! You can let him know at any moment what you feel like and the pace is kept enjoyable for the entire activity. For this Small-Group tour, you can let your guide know how much experience you have and a route will be adapted perfectly to your requirements. If you would like, you can extend your stay in the national park for a bit with a lunch in one of the villages along the way.